Guernsey FC boss Tony Vance says his side's Isthmian League Division One South play-off hopes were over before their 4-1 loss at Tooting & Mitcham. Despite Robbie Legg's opener, it was a seventh defeat in eight games and left the Green Lions in the bottom half. 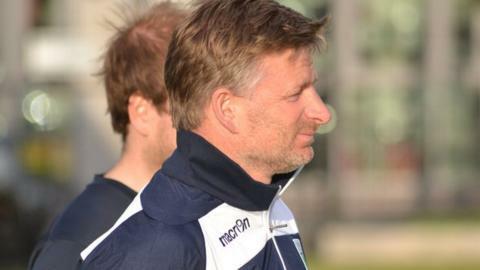 "Anyone that thought we would get in the play-offs I think is dreaming a bit," Vance told BBC Radio Guernsey. "We were well out of it after that run of six losses - unfortunately we've missed that opportunity." Tom Martin, Marc McGrath and Dave Rihoy all returned to action for the Channel Islanders after long spells out injured. Guernsey kept a clean sheet last weekend but have conceded 12 goals in their last four defeats. "You might as well lose 3-1 or 4-1 because you've got to go and try and get something from the game," added Vance. "At no point do we say we'll close up shop and be done with that. "Physically we weren't quite there, so there's no complaints. They deserved to win the game given the circumstances. "No excuses. The squads we've had have been decent enough to try and get results and we've fallen away unfortunately."